It seems appropriate that a play which revolves around two shipwrecked siblings is victim to Auckland’s inconstant elements. While a rain-soaked atmosphere won’t be part of everyone’s Twelfth Night experience, the unpredictability of the weather is an integral part of attending the Pop-up Globe, especially for the exposed groundlings. The actors, despite having to compete with the sound of steady rain, have a lot of fun with the bonus backdrop, ad-libbing and even finding new meanings in their lines. Eventually the weather subsides and the show goes on as per usual, but the mood created by the rain continues to linger evocatively over the setting of Illyria. 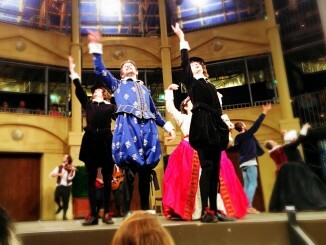 The best thing that can be said about director Miles Gregory’s all-male Twelfth Night is that it’s funny. It seems like an obvious comment to make about one of Shakespeare’s most beloved comedies, but too often I’ve found myself laughing at the wit and humour of Shakespeare rather than the productions themselves. While Gregory’s production doesn’t do anything surprising with the text, it does push the comedy to its natural limits, from suggestive to downright explicit. In many ways the show is a celebration of vulgarity and misbehaviour. And it’s there that it excels. But, like all of Shakespeare’s best comedies, it should be more than just the sum of its laughs. Occasionally sacrificed is the sense of Twelfth Night’s poetic enchantment. The romances, in particular, feel one-dimensional. The main love triangle between Duke Orsino (Carl Drake), Viola/Cesario (Aaron Richardson) and Olivia (Daniel Watterson) suffers the most here. Richardson’s performance has none of the feistiness that I expect from one of my all-time favourite Shakespearean heroines, and is reduced to an awkward wallflower. The romantic tension that blossoms between Cesario and Orsino is also mostly played as a gag, and risks devolving into a cheap gay joke. Watterson as the play’s love object is outstanding though. There’s never a moment he doesn’t shine, perfectly balancing both the coldness of a grieving sister with the passion of a newly awoken heart. 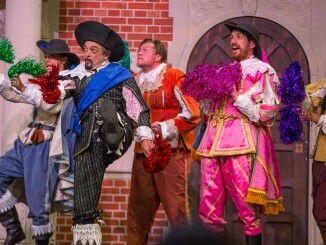 While usually considered the subplot, the antics between Malvolio (Stanley Andrew Jackson III), Toby Belch (Edward Newborn), Feste (Adrian Hook), Andrew Aguecheek (Paul A Willis) and Maria (Stephen Butterworth) play to the strengths of this production. Newborn and Hook display an effortless confidence in their handling of the text, never overplaying their characters. Willis’ drunken acting is also highly amusing, though lacking in variation. But Butterworth is the clear standout of the entire play, embodying his femininity without ever making parody of it. He’s not only in total command of his character, but also in total command of the audience. For all its superficial attempts to be “traditional” or “authentic”, the production seems afraid to fully commit to this decision. And some of the attempts to play against expectations end up feeling inconsistent rather than subversive. The most incongruous example is Jackson III’s Malvolio, performed with a heavy American accent and a distractingly staccato manner. Not only does it stick out like a sore thumb against the rest of the cast who share a more uniform “Shakespearean voice”, but it also serves to undermine the style established by the show. And is there ever a good reason for modern production of Shakespeare to adhere to old-fashioned, all-male restrictions on casting anyway? I’m inclined to say no. But the casting for Olivia and Maria is so perfect it’s easy to justify the decision. Regardless of gender, you are unlikely to see better portrayals of either character in a long time, which is reason enough to see this production. But better than restrictive casting, perhaps, would have been casting without any constraints whatsoever, reflecting the slippery nature of identity that the play embraces. The beauty of the play lies in its contradictions and dualities. The romantic versus the comedic, the masculine versus the feminine, deception versus truth, puritanism versus hedonism. While this production tends to drown itself in laughter, losing some of these subtler nuances, its entirely successful as a piece of pure entertainment. The evening flies by quickly and—most importantly—with great clarity. Accessible to more than just fans of Shakespeare, the Pop-up Globe’s Twelfth Night is filled with enough joyfulness and hilarity to please the groundling inside anyone. Twelfth Night plays at the Pop-up Globe until 16 April. Details see Pop-up Globe.